If you're a Radiation Therapist (or Radiotherapist), you know what your job entails. You examine and perform basic maintenance on linear accelerators and other radiation machines, educate patients about radiation treatment options and answer their questions, carry out x-rays to pinpoint the affected areas, prepare themselves and their patients for radiation treatment by wearing protective clothing, operate radiation machines and monitor patient behavior, check that the appropriate amount of radiation is administered, record patient progress and more. OK - but the question is, how do you translate that information onto a resume in such a way as to motivate a hiring manager into picking up the phone? If you're not sure, that's OK. Most people aren't used to thinking about their jobs in a promotional sense. But a good resume writer? Well, that's what they do. Former recruiter David Alan Carter recommends the following resume services for Radiation Therapists or Radiation Therapy Technologists... each with a Better Business Bureau score of "A" or better. Considering a Career Move into Radiation Therapy Technology? If you're considering a move into Radiation Therapy Technology from either a closely related field or from a totally unrelated profession, you'll be looking for a transitional resume -- and a talented resume writer to handle the assignment. Transitional resumes are some of the most difficult resume projects as they require a writer knowledgeable in at least two professions -- and the ability to identify transferable skills from one to the other. What You'll Do: In the medical field, radiation is most commonly used to kill cancer cells because it stops them from growing out of control. As a radiation therapist, you'll be in charge of operating the radiation equipment used to treat cancer patients and those with other conditions that require radiation treatment. Due to the hazardous nature of working with radiation, you must abide by a strict code of conduct. You will wear protective gear to shield yourself from potentially damaging concentrations of radiation. The job can be tiring as you may need to lift and adjust patients who are overweight or have physical disabilities into radiation machinery or specific positions. You will probably work full-time hours in a large hospital or cancer treatment center and enjoy a regular schedule. Prospective radiation-care workers should be friendly and outgoing since dealing with patients is a daily task. They should also possess great written and oral communication skills in order to accurately convey information to patients and other medical personnel. Those who are naturally detail-oriented and technical should do better on the job since proper operation of complex radiation machinery is required. Education and Training: Most radiation therapists have two-year or four-year degrees in radiation therapy, although it is possible to be hired with a one-year certificate. During your coursework, you will delve into topics including: human anatomy and physiology, radiation therapy procedure and theory, algebra, physics, computer science, and research methods. Most formal training programs also require hands-on experience with radiation machinery in a hospital or other clinical setting. In addition to the schooling, you must also get your license to practice. 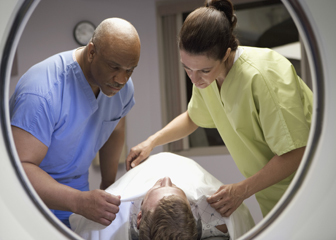 To get licensed, you'll need to be a graduate of an accredited radiation therapy program and be certified by the ARRT. Certification requires the successful completion of the ARRT exam. The Future: The Radiation Therapist or Radiotherapist profession is expected to grow at about 20% through 2020. The Pay: Annual salaries for Radiation Therapists in the U.S. range from $50,900 to $110,500, with the average median annual wage hitting $77,500 in 2012 as per the U.S. Bureau of Labor Statistics. Still interested in pursuing a position in Radiation Therapy? Got the qualifications? Great. The next step is to prepare for a consultative telephone interview with your resume writer. Treat the coming job search like the business it is, and you'll do fine.